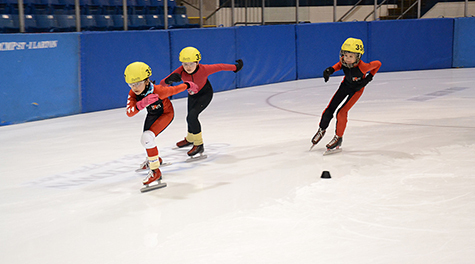 Speed Skate PEI’s overall coaching philosophy is based on the Long Term Participant and Athlete Development (“LTPAD”) model adopted nationally by Speed Skating Canada. The athletes and participants are at the centre of the program and the philosophy is applied within the appropriate context for each level of the program. The coaches are there to help the children and athletes reach their full physical, intellectual, and social potential through well-established programs for each level. All skaters are equally important, whether they are the youngest or the oldest, the slowest or the fastest. The program is delivered to meet the needs and goals of the child/athlete. For our Learn to Skate Program, the emphasis is on fun and participation. We want to make the skaters comfortable on the ice. Children in this age group will learn by doing but they will only do so if it is fun and their social needs are met. Every child will progress at a different rate but they will all get there if they are having fun. The emphasis in the Learn to Speed Skate Program remains on fun and participation. The skaters learn the essential skills of skating and speed skating, and learn to appreciate the joy of skating fast. Children learn the concept of “personal best” and how to enjoy the thrill of racing in a safe, non-threatening environment. Special attention remains on the development of the child and ensuring that their social needs are met in the program. Our Intermediate and Advanced Speed Skating Programs are designed to train our skaters for regional and national competition, while remaining a fun and supportive environment. The concept of “personal best” and the importance of effort remain touchstones of these programs. Learning how to train properly, refining speed skating technique and developing a healthy approach to competition are important parts of these programs. The Recreational Program is for older skaters (13 to adult) who want to enjoy speed skating but who don’t necessarily want to compete at a high level. It provides them the opportunity to participate to their desired level in training and skill development.